Libya insists on trying Saif and Senussi in national courts but have custody of neither. The ICC cannot give Libya the right try them. 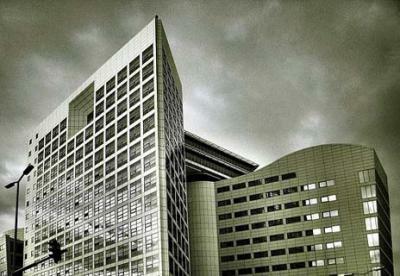 The International Criminal Court in the Hague. Photograph by Josef Stuefer. The debate over who should try Saif al-Islam Gaddafi and Abdullah al-Senussi began even before the grisly demise of Colonel Muammar Gaddafi. In June 2011, Senussi, the former Libyan military intelligence chief, and Saif, Colonel Gaddafi’s son and one-time heir-apparent, were indicted by the International Criminal Court (ICC) for their alleged roles in crushing the Libyan uprising. Deciding where they are tried goes to the very heart of the ICC’s complementarity regime, wherein the court can only investigate and prosecute when a state is unable or unwilling to do so itself. This principle is premised on the belief that while it is best to deal with atrocities where victims and survivors live, states emerging from, or still mired in, violent political conflict often do not have the capacity or interest to investigate these crimes themselves. If this is deemed to be the case, the duty is transferred to the ICC. After four decades of autocratic rule under Gaddafi, many argue that Libya is unprepared and unable to legitimately, effectively, and impartially prosecute Saif or Senussi. Libya’s National Transitional Council (NTC), however, has claimed that both must be tried in Libya, under Libyan law, by Libyan judges. In May 2012, the NTC issued an admissibility challenge at the ICC in which it claimed that the ICC’s case against Saif and Senussi was “inadmissible on the grounds that its national judicial system is actively investigating Mr Gaddafi and Mr al-Senussi”. At the same time, in an effort to demonstrate that it was prepared for trial, Libyan authorities unveiled a refurbished courtroom in Tripoli as well as a luxurious prison complex on the outskirts of the capital where it was suggested that Saif would be held during his trial. Problematically, however, Libya still does not have custody over Saif or Senussi. Despite numerous declarations by the NTC that he would be transferred to Tripoli, Saif remains in the hands of the Zintan brigade that arrested him in November 2011, who have refused to surrender Saif to Libya’s national authorities. It is also widely believed that the Zintan militia used their custody of Saif as leverage to get local commander Osama al-Juwali appointed as Libya’s interim defence minister. More recently, the Zintan brigade has insisted that Saif be tried in Zintan rather than Tripoli. Libyan authorities appear to have conceded to this position as the chief Libyan prosecutor in Saif’s case, Milad Abdul-Nabi Dekali, confirmed that Colonel Gaddafi’s son would be tried in Zintan. Given the unwillingness of the Zintan brigade to cooperate with the NTC, it is far from clear that Libyan authorities themselves would be able to conduct the trial. The NTC handed power over to a newly elected national assembly on August 8, but it is unclear at this early stage whether this will make a difference to negotiations around the trials. Senussi is even farther away from being transferred into Libyan custody. In March 2012, the former intelligence chief was arrested in a joint operation between French and Mauritanian authorities in Nouakchott, the Mauritanian capital, where he remains after the NTC failed to convince Mauritania to extradite him to Libya. One Mauritanian source suggested that Senussi’s transfer to Libya “looks like wishful thinking by the Libyans”. Meanwhile President Mohamed Ould Abdel Aziz of Mauritania declared that Senussi, Gaddafi’s “black box”, would not be extradited before facing charges of illegal entry in Mauritania. In short, it doesn’t appear that either Saif or Senussi will be in the custody of Libyan national authorities any time soon. And without effective custody of Saif or Senussi, the chances for Libya’s admissibility challenge are fundamentally undermined. Under the Rome Statute (Article 17(3)), judges must consider whether “the State is unable to obtain the accused”. Put simply, if the state in question does not have custody of the accused, then ICC judges cannot yield jurisdiction to national courts, something Saif’s defence counsel at the ICC has highlighted. Kevin Jon Heller, Senior Lecturer at the Melbourne Law School, also argues that Libya’s inability to acquire custody of Saif or Senussi is “the primary reason why Libya’s admissibility challenge must fail”. At the same time, Libya’s admissibility challenge has exposed deep and acrimonious divisions within the ICC. The Office of the Prosecutor (OTP), which was until recently led by Luis Moreno-Ocampo, originally sided with Libya in its admissibility challenge. Moreno-Ocampo also demonstrated an unprecedented degree of leniency towards the NTC’s aim of trying Saif and Senussi in spite of prevalent concerns over the independence of Libya’s judiciary and the likelihood of them receiving the death penalty. The Office of Public Counsel for the Defence (OPCD) took issue with the OTP’s stance and even requested that the ICC’s Appeals Chamber dismiss Moreno-Ocampo from the case due to “an objective appearance that the prosecutor is affiliated with both the political cause and legal positions of the NTC government”. The Appeals Chamber ultimately rejected the OPCD’s motion but not before sharply rebuking the prosecutor, declaring that his “behaviour was clearly inappropriate in light of the presumption of innocence” and “may lead observers to question the integrity of the Court as a whole”. Tensions then came to a head when four staff members from the OPCD were arrested on June 7, 2012, following a meeting with Saif in Zintan for allegedly breaching Libya’s national security. Despite widespread recognition that the staff enjoyed diplomatic immunity, they were only released on July 3 and only after the ICC apologised to Libya for any “difficulties” caused by its staff. Numerous commentators have suggested that the ICC’s apology may undermine its future authority and legitimacy, and that the ordeal may hamper the capacity of ICC staff to work in fragile political contexts. The debacle, however, also demonstrated the depth of divisions within the ICC. Upon their arrest, Libyan authorities informed the detained staff that they had been arrested as “retaliation” for the defence’s previous filings. Nick Kaufman, a lawyer for the Gaddafi family, argued that the staff had “fallen victim of this hostility which is because of the intensity of the litigation”, and that ICC “filings contributed to cementing the anger of the local authorities holding Saif”. The rancour was also evident when Moreno-Ocampo appeared to blame the OPCD staff themselves for their arrest in Zintan, saying that “it’s not what we would expect of the Court, of the defence”. Without custody of either Saif or Senussi, it is difficult to see the ICC ruling in favour of Libya’s admissibility challenge. Moreover, doing so would send an implicit political message that illegally arresting and detaining ICC staff was unproblematic. Nevertheless, it also seems unfathomable that Libya will cede jurisdiction or surrender Saif to the ICC, regardless of what the ICC’s judges rule. Indeed, Ahmed Jehani, Libya’s representative to the ICC, has declared that “no amount of pressure will push Libya to hand [Saif] over”. With Libya and the ICC are locked in a stalemate with neither side able or willing to compromise, it looks like this legal and political wrangling may continue for some time. PreviousPrevious post:Somali Piracy: Is Taking the Fight to Land the Solution?